Says Steven 'Scrappy' Beach, "We call the ravens and other birds that mingle with us 'locals' and say that when the 'locals' fly, so must we." I am trying to make a photo album this evening, but Typepad is being a turtle...so if not tonight, then tomorrow, for sure. Sitting on top of Tater Hill (approx 5000 ft) clinging to boulders, I felt local...if'n you ever get the chance...I recommend the experience, y'all. You can read all about the sport at Paraglider Magazine. Hopefully they are covering the Tater Hill competition. **Update** I added a little photo album of yesterday's trek up Tater Hill. Enjoy the view! 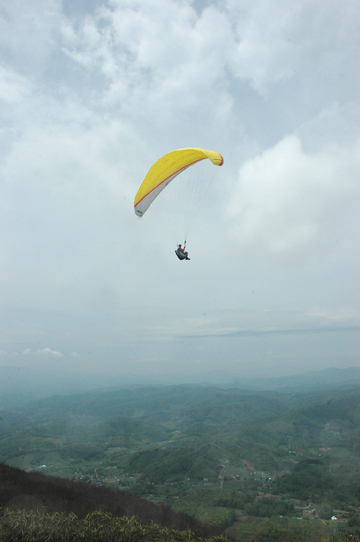 For results and much more information about the Tater Hill Paragliding Competition, please visit Fly Tater Hill .